Photos are emerging of new, slick green MV-22 Ospreys, now assigned to Marine Corps Helicopter Squadron One for presidential support. We first reported on the Osprey makeover in August 2011, after a solicitation for an Osprey VIP kit emerged. 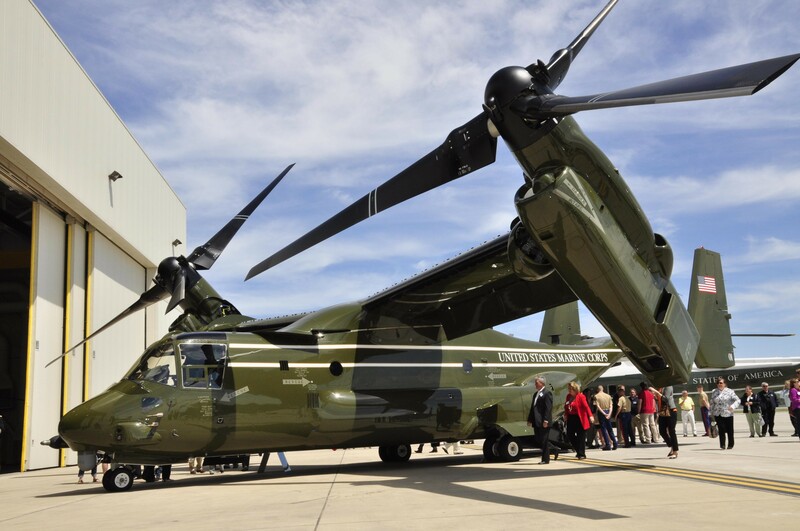 The aircraft is now finally part of the unit’s inventory and was welcomed at a May 4 introduction ceremony aboard Marine Corps Base Quantico, Va., where the unit is based. HMX-1, the unit that mans the president’s Marine One helicopter, will use the aircraft for so-called “greenside” missions. They will support White House travels by shuttling essential equipment, personnel and even VIPs, although the aircraft are unlikely to transport the president himself. He only rides on one of two custom-designed helicopter models — the older Sikorsky VH-3D and the newer VH-60N, a modified Black Hawk. The new HMX-1 Osprey will replace the medium-lift capability provided by the CH-46 Sea Knight – better known as the PHROG – which has been in service since the early ’60s. In addition to the spit and polished green paint job, the VIP kits include black carpets, the HMX-1 logo emblazoned on the tail ramp, seat covers and walls and ceilings that hide the tangle of wires and hydraulic lines inside the cabin. “The VIP kits are a cosmetic addition to the cabin that will enhance the appearance and comfort of a utility aircraft, and can be installed or removed in a matter of minutes,” 1st Lt. Scott Villiard, a Quantico spokesman, told Marine Corps Times when the contract was released in 2011. That’s a very nice Helicopter. Mr. President will fly very comfortably and fly much faster than he would with any other Helicopter. The Osprey isn’t a helicopter. Will. It’s a tiltrotor which is a hybrid. If it was a helicopter, then pilots who get certified to fly the V-22 would receive rotary winged ratings on their licenses from the FAA, which they don’t. They receive powered lift ratings. We receive both rotorcraft and multi-engine airplane ratings after completing training in both during flight school. Once again, the V-22 is not a helicopter.